TreePhilly’s Community Yard Tree Giveaway program empowers Philadelphia community groups to grow the urban forest in their own neighborhoods. 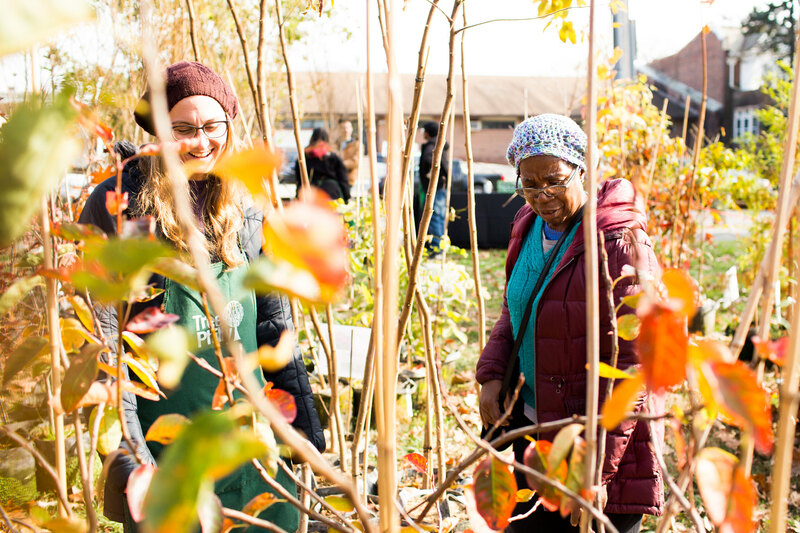 Through this program, we provide small grants to community groups to host their own yard tree giveaways each spring and fall. We do what we do best – provide FREE trees, mulch, and education. Community groups do what they do best – connect to neighbors, friends, and families! This season we are offering up to 12 grants to community groups and local businesses to host yard tree giveaways in their neighborhoods between October 1st, 2018 and November 18th, 2018. Giveaway events must be held in Philadelphia, and trees must be planted in Philadelphia on private property (not in the sidewalk or in containers). We encourage applications from undeserved neighborhoods with low-tree canopy: Dickinson Narrows, Fairhill, Harrowgate, Feltonville, Fern Rock, Frankford, Gray’s Ferry, Haddington, Cobbs Creek, Hunting Park, Logan, Lower Moyamensing, Mantua, Millcreek, Ogontz, Olney, Oxford Circle, Point Breeze, Sharswood, Swampoodle, Poplar, Stanton, Strawberry Mansion, and Nicetown/Tioga. Scroll down to learn more or download the TreePhilly Community Yard Tree Giveaway Grant Application F18 here. •	Applicants must serve Philadelphia or a Philadelphia community— Nonprofits, faith-based organizations, civic associations, Tree Tenders groups, local businesses, school associations, and similar organizations. We also accept joint applications from no more than 3 partnering organizations. •	Groups must have the capacity to plan, promote, and run a giveaway, including providing staff and/or volunteers to work the event. •	Events must be held in Philadelphia. •	Fall 2018 giveaways must be held between October 1st, 2018 and November 18th, 2018. Events may not be scheduled for Saturday, November 10th. o	Space could be: a yard, parking lot, large sidewalk, patio, or playground. •	Giveaway events must include a contingency plan in case of inclement weather (e.g. indoor space, rain date, etc.). •	Participating in a grantee training on Wednesday, September 19th, 2018. •	Securing an event space that includes: (a) indoor space or tents in case of bad weather, (b) secure location to store trees before and after the event, and (c) parking or transportation access for participants. •	Planning and promoting their giveaway event. •	Registering tree recipients using a required spreadsheet template. •	Organizing at least 4 volunteers/staff to run event. •	Providing all other giveaway materials and supplies, including tables, chairs, pens, registration sheets, etc. 4)	A brief report (no more than five pages) detailing how the requirements listed in this agreement were met, a summary of successes and challenges of the giveaway, and feedback on the grant program. 5)	Signed agreement with recipient’s financial sponsor if applicable. Please submit your answers to the following questions in a separate Word document that is no more than five pages. To submit your application by email, please include your organization’s name in the title of the document and send it to treephilly@phila.gov by 11:59PM on Friday, August 31st, 2018. To submit a paper application, please mail it to TreePhilly, Philadelphia Parks & Recreation, 1515 Arch Street 10th Floor, Philadelphia, PA 19102. We will confirm receipt of all applications. Applications received after the August 31st deadline will not be considered. 6)	Please tell us a bit more about your organization. What do you do, who do you serve, and why? 7)	If partnering with other organizations, please answer questions 1-6 for each group. 8)	Why does your group want to host a TreePhilly Community Yard Tree Giveaway? 9)	How would a Community Yard Tree Giveaway help your community? How would trees help your community? 10)	Describe the community you serve and how you connect with them. Do you work with property owners? Renters? Families? Do you communicate with them on listserv, face-to-face, at events? a. (a “Small” tree will grow to between 12-30 feet tall, a “Medium” tree will grow to between 30-50 feet tall, and a “Large” tree will grow to over 50 feet tall). 12)	Does your group have the capacity to staff and run a yard tree giveaway? Please write a brief summary of any events your group has recently organized. 13)	Please provide a preliminary plan for your giveaway event. Include a proposed date, time, and location; the number of trees* your group is requesting (25, 50, 75 or 100). Describe how you would handle registration, how you would staff the event, how your event would flow, and what you would do in case of inclement weather. Address the requirements and guidelines listed on page 2 of this application. The deadline to submit applications for Fall 2018 Community Yard Tree Giveaway Grants is Friday, August 31st, 2018. Winners will be announced on Wednesday, September 5th, 2018.